NumberSmasher clusters integrate the latest Intel Scalable Processors, “Cascade Lake-SP.” They scale from small departmental clusters to large-scale, shared HPC resources. Years of Microway Linux cluster design and integration expertise ensure your cluster arrives with superior performance and functionality compared to competing hardware. Our experts would be happy to guide you if you have any questions! For dense High Performance Computing clusters, we provide up to 4480 processor cores in a standard 42U rackmount cabinet. 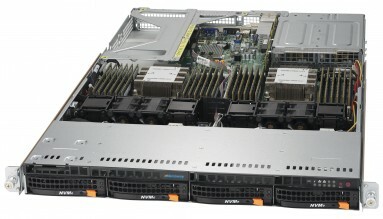 Our NumberSmasher Twin2 servers include four dual-processor compute nodes (totaling 224 cores) in a 2U chassis: effectively doubling rack capacity. 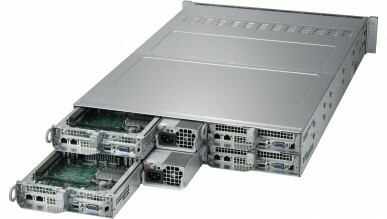 Microway also offers standard 1U nodes with a density of up to 56 processor cores per rack unit. Up to 2240 cores can be achieved in a single cabinet. Customers requiring increased storage or I/O may choose 2U or 4U nodes with reduced cabinet density. 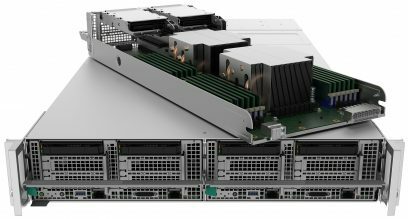 Finally, NumberSmasher QuadPuter 4P nodes offer an SMP-based Xeon Scalable Processor platform in a 2U form factor. These systems include up to 112 cores, 6 TB of DDR4 memory. They are ideally suited for large memory nodes.